Arrive in charming Baden Baden, a popular spa town famous for its Roman baths. Enjoy a private evening concert at a fine Baroque palace. It’ll be an evening of grandeur unlike any other, and a chance to create memories that you’ll cherish for a lifetime. Freechoice: Take a guided tour of this historic city, which straddles two of Europe’s most beautiful rivers. Six tranquil places in the old part of Koblenz offer more than 100 glittering, festive, cottage-style stands and Lebkuchenherzen – traditional gingerbread hearts – to create a magical European Christmas experience. Alternatively, discover Cochem – a true medieval gem on the banks of the Moselle River. You’ll feel as if you’re stepping straight into a fairytale on a guided tour that culminates in a visit to the iconic Reichsburg Castle. Freechoice: Experience an iconic canal cruise. Alternatively, discover charming Volendam before visiting the equally lovely village of Edam, or take to the streets with a local guide on the walking tour including a tasting of the Dutch favourite, herring. Admire festive decorations and twinkling lights along streets and squares – even your Scenic Space-Ship will be decked out in all the Christmas finery. Delight in the charms of a European Christmas in Switzerland before embarking your cruise along the Rhine. Visit charming Strasbourg, explore Heidelberg Castle, take in the spa resort town of Baden Baden and visit Koblenz, then explore Cologne’s Christmas markets. 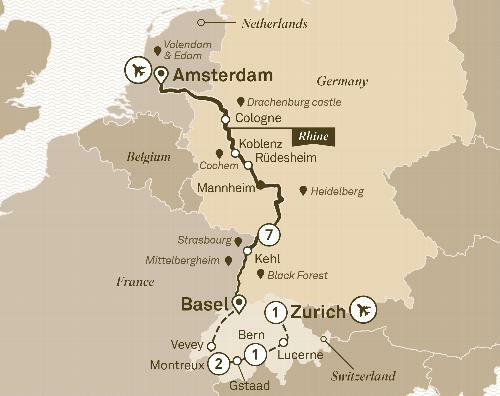 Marvel at the World Heritage-listed Rhine Gorge before discovering the canals of Amsterdam. Throughout your journey, you will be enchanted by the magical traditions of Christmas, including the fragrant aroma of glühwein, roasted chestnuts and bustling markets bursting with festive excitement.